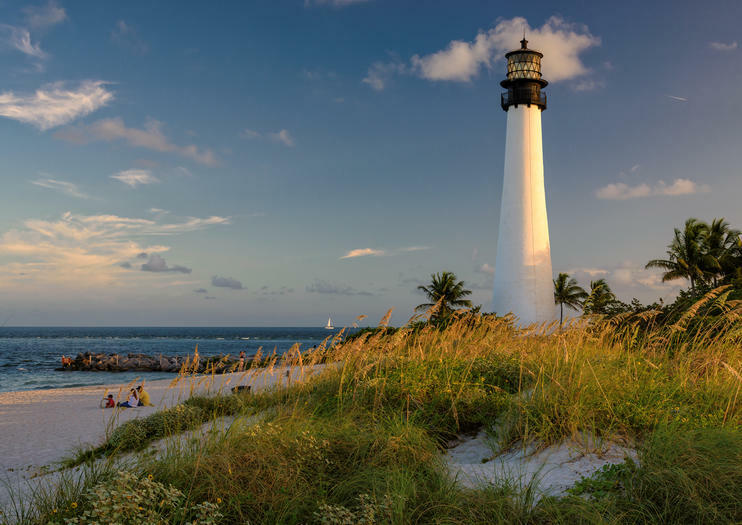 Cape Florida, officially known as Bill Baggs Cape Florida State Park, is home to a historic lighthouse dating back to 1825 and serves as a popular place for visitors to relax, sunbathe, swim and picnic. Although the lighthouse was reconstructed in 1847, it remains the oldest standing structure in Miami-Dade County, and this stretch of sandy beach runs for over a mile, over which other activities such as fishing, kayaking and bike riding take place. It’s hard to imagine that the tranquil area was once the site of significant bloodshed in the 18th century, when marauding pirates and Native Americans used the area as their hunting grounds. One of the most notorious pirates was Black Caesar, who terrorized the region until he was caught and hanged in 1718. Guided tours of the lighthouse and lighthouse keeper’s cottage are given twice daily from Thursday through Monday. Picnickers can reserve pavilions and are allowed to grill, but if you’re hoping to grab food out, Cape Florida has two restaurants, Lighthouse Café and Boater’s Grill, which offers authentic Cuban cuisine. Umbrellas, beach chairs and bicycles are available for rent as well.